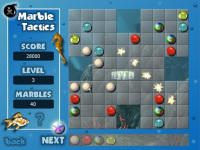 In Marbles Tactics, player must remove the marbles on the screen as many as possible by positioning them in such a way that they can form a straight line either vertically, horizontally or diagonally. Minimum number of marbles required is four pieces. More than four will get extra scores. There are two game modes available, namely classic and endurance. Classic mode contains 20 levels that will challenge your logic in composing marbles. Whereas in endurance mode, player will play as long as he can survive. There are also special marbles that can be paired with any marble and some of them can explode and remove marbles around it. Take advantage of them optimally to form more marble lines.